Buy Liqua eLiquid - Banana 30ml in Melbourne, Australia. 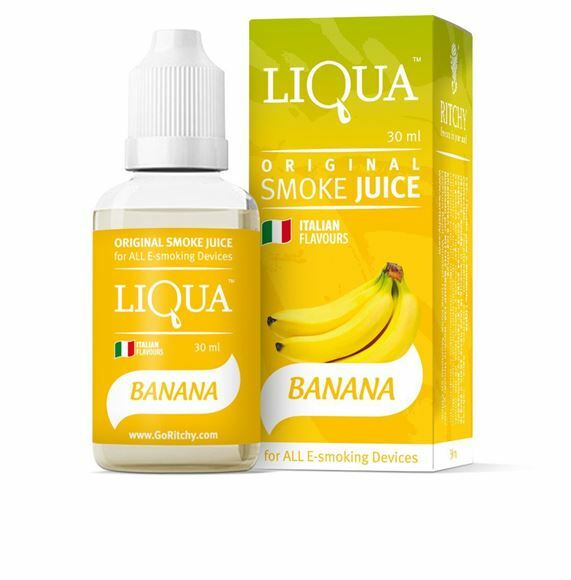 So what is Liqua eLiquid - Banana 30ml? Banana offers for you simple taste of a sweet and ripen banana. Like any other fruit enhancing flavours, this one is additionally suitable for the less escalated smoker searching for a lighter flavour. You can't to wrong with one of our generally well known flavours. E-liquid Banana surges your taste buds with the smooth and marginally sweet tones. Like most other fruits, this one is delicateness suitable for smokers who are searching for a lighter flavour. LIQUA’s full range of tastes are designed carefully by those who really know what theyshould be – the most professional flavorists from Italy. That means LIQUA’s Tobacco taste is truly right - as fresh as natural leaf Tobacco. LIQUA Banana flavor is as juicy as a real green Banana, and LIQUA Coffee – tastes as good as what you’ve got in your morning cup. Enjoy recharging your electronic cigarette in just a few seconds. Our specifically designed silicone spout and soft bottle structure perfectly fits all e-cigarette starter kit tank system as well as open-type cartridges (eGo, 510, Kanger Mini ProTank, Aspire Mini Nautilus). UseLiqUA Smoke Juice to refill your device and experience hassle free vaping.